PLATELET RICH PLASMA (PRP) is a procedure that involves withdrawing a patient’s blood, processing it to isolate the platelet-rich plasma, then re-injecting it to erase wrinkles and create a more youthful look. Used by celebrities such as Kim Kardashian, the skin tightens, and glows with color, and scaring softens for a beautiful younger and very natural result. 1. Skin color becomes more gray because of less blood flow. 2. Facial Shape becomes collapsed and droopy as muscle and collagen decrease. 3. Skin texture becomes less smooth. As a result, the person looks “worn”, or “tired” or “droopy.” The lively, rosy hue (seen plainly in playing children of every skin color and in young adults) fades to a dull gray. In the first part of the PRP procedure, the physician uses an Hyaluronic Acid (HA) filler (like Restylane® or Juvederm®) in a very specific way to sculpt a younger appearing face–while still keeping the shape natural. The Science Of Pure Beauty Our injection technique implements the science and mathematics of pure beauty. As far back as Leonardo Da Vinci up until the present day, physicians, scientists and artists have worked to define what shapes, contours and proportions make a face more beautiful. The challenge becomes how to take a face and bring out that which is beautiful, without creating a shape that appears unnatural. In the art and science of pure beauty, millimeters are miles. Therefore, your injector employs the ideas of artists and scientists who have deeply studied beauty when considering where and how much HA filler and growth factor to apply. First, the medical professional draws about 20cc’s of blood. Then, using the latest Tru PRP® technology to isolate platelets from that blood (platelet-rich plasma or PRP)–all within about 30 minutes in the office. Then she “activates” those platelets to cause the release from the platelets of at least 8 growth factors that would normally be used to heal injured tissue. These growth factors work like magic to cause increased collagen & new blood flow. To rejuvenate new skin, these growth factors must be put back into your face. The whole in-office procedure takes about 60 minutes with minimal discomfort and downtime. Understanding Tru PRP® Discover the quality of Magellan® TruPRPTM. 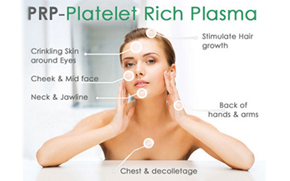 OUR NEW, STATE OF THE ART TECHNOLOGY Platelet Rich Plasma is customized for each patient, based on individual needs. to ensure therapeutic effect and outstanding results. The Magellan® technology provides an automated dual spin processing system that can deliver (PRP) Platelet Rich Plasma as well as (PPP) Platelet Poor Plasma. Using numbing cream and a very small needle (for almost no pain), the medical professional injects the patient’s own growth factors back into the face in a particular way. These growth factors then activate multi-potent stem cells already in the skin (tricking them into “thinking” there’s been an injury and new younger tissue should be generated). The multi-potent stem cells then develop into new collagen, new blood vessels, and new fatty tissue trying to “repair” the skin that was never injured! The result…younger-appearing skin! The effects of the procedure improve for 2 to 3 months and last for at least 1 to 2 years!